I am excited to share that I’m now an official ambassador for Worth Living. Worth Living is a community of people from all over the world who are creating a mental health initiative. I was approached on Instagram by the founder to become part of an amazing team of people; of course, I said YES! There is no other feeling then being a part of a community with like-minded people coming together to stand up for something that is so close to the heart. It’s inspiring to speak with individuals who have gone through the same struggles; comforting to know I am not alone. By sharing our stories we are creating a conversation about mental health. The two simple words “Worth Living” are a symbol of the struggles I have overcome and I’m honored to wear a shirt that represents that. 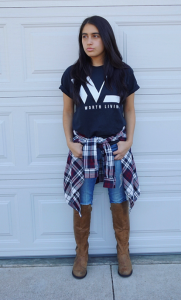 Worth Living has different products you can purchase and a portion of the proceeds are donated to two amazing organizations that promote mental illness awareness. My goal is to be involved in as many organizations as possible that are starting the conversation in hopes to finally end the stigma of mental illness.